Who is in the Collective? 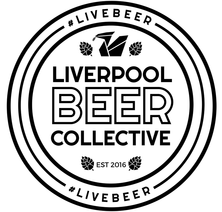 The Liverpool Beer Collective is an initiative set up by Merseyside beer enthusiasts, bloggers, brewers, bottles shops and bars to promote and share the excellent beers produced by our partner breweries, and celebrate the vibrancy of our local beer scene. ​The focus is on highlighting quality beer and developing a spirit of co-operation, building on the city and region’s proud heritage. We believe that with the talent and variety available within the Merseyside beer scene, there is an opportunity to educate and delight the drinkers of our beers, and help our region become a prominent beer destination in U.K.
© Liverpool Beer Collective, 2016 - 2019. Unauthorized use and/or duplication of this material without express and written permission from this site’s author and/or owner is strictly prohibited. Excerpts and links may be used, provided that full and clear credit is given to the Liverpool Beer Collective, with appropriate and specific direction to the original content. Do you like our logo? It was created by John-Paul McKeown, a great piece of work of which we are massively appreciative! !